The Heslam Trust has existed since 11th July 1963 and the Trustees have enjoyed almost 50 years of spending the income from it to purchase works of art for the City of Lincoln and supporting the Cathedral. The Trust was the vision of a business man called James Reginald Heslam. It was realised some time ago that we knew a little about James Reginald Heslam but not enough to know what influenced him to be so generous to the City of Lincoln and the wider community in which he worked. It is well known that our upbringing has a significant influence on how we develop as adults so we began our research with the Heslam Family Tree. 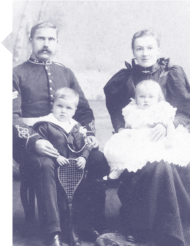 (Pictured from left to right: the Heslam family in 1896, ith James Reginald at 3 years and his sister, Winifred as a baby. Middle: James Reginald at the age of 16 wearing his school uniform. Right: James Reginald as a young man). James Reginald’s father, James Phillips Heslam was born 1st March 1867 in Carlton le Moorland, Lincolnshire. He joined the Royal Artillery as a boy entrant at the age of 15 years, married Sarah Jane Chappell in January 1892, and by the time James Reginald was born on 3 July 1893 at Woolwich, his father was a Sergeant Instructor of Gunnery . A second child, Winifred Julia Wilson, was born on 12 February 1895. Shortly afterwards Sergeant Gunner Heslam was posted to Bermuda and took his family with him. Their three other children, Edith Eva, Joseph Clarence Somers and John Cyril Somers (twins) were born during their five years abroad. Tragically John Cyril died before he was one month old and we can only imagine the effect this would have had on the family. Sarah Jane was taken ill and it was decided that James Phillips would take leave and they came home to England in early 1900. Shortly after their return to Carlton le Moorland a second tragedy befell the family when James Phillips himself developed Pneumonia and died on 26 July 1900 at the age of 33 years. A third tragedy occurred on 24th March 1902 when Edith Eva died at the age of five years. As a young widow Sarah Jane moved to a property in Harmston and opened a grocery shop. James Reginald was sent to the Royal Hiberian School for Soldiers Sons in Ireland, and Winifred to the Royal Soldiers Daughter’s school in Hampstead. We can assume that the loss of his father and two siblings, all before he was 9 years old would have affected James Reginald greatly, and we would expect the Military Schools to have been very strict and taught him independence and the precise manner which he developed as an adult. Couple that with the fact that his father was a very religious man and preached at Methodist churches and was Secretary of the Christian Soldiers Association before leaving for Bermuda, and earned great esteem in Bermuda working with the Methodist Episcopal Church of America, it is no surprise that James Reginald became a life-long member of the Methodist Church. 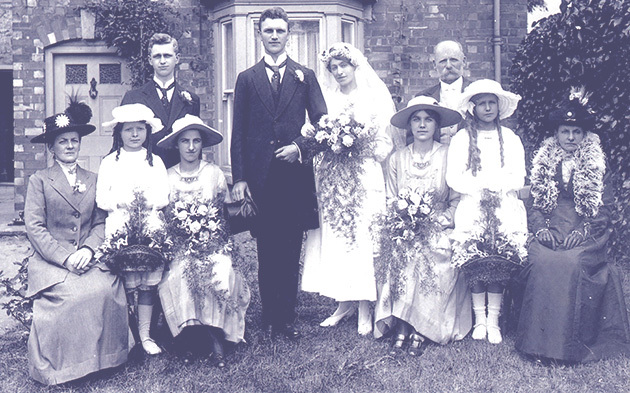 James Reginald Heslam married Mary Elizabeth Barnes at Harmston Lincs on 12th June 1918. The happy event is recorded in this photograph. Reading left to right front row:- Sarah Jane Heslam (mother of bridegroom), Beatrice Long (cousin of bride),Dorothy Irene Barnes (cousin of bride), James Reginald Heslam (bridegroom), Mary Elizabeth Heslam (nee Barnes) bride, Winifred Julia Wilson Heslam (sister of bridegroom), Olive May Barnes (daughter of bride’s cousin William Barnes), Elizabeth Barnes (mother of bride). Back row, left to right Joseph Clarence Somers Heslam (brother of bridegroom), Alfred Barnes (uncle of bride). James Reginald Heslam had a very successful business career and his community service was exemplary, We list below details of his career and of the many voluntary offices he held. 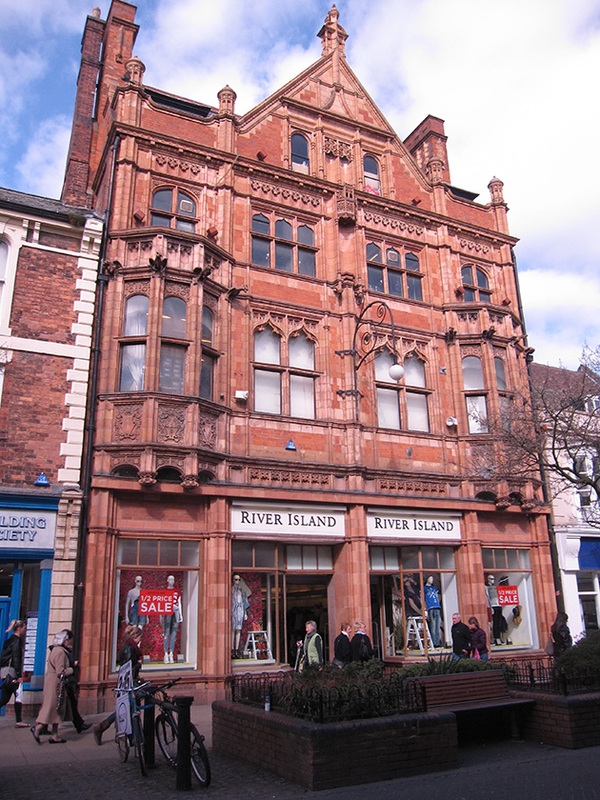 First job, a Clerk in the Ruston and Hornsby Engineering Works in Lincoln at age 16 and then for a corn merchant where he quickly learned the art of buying and selling. First business venture, Running a Newsagent and Post Office in Caythorpe Lincs where he introduced a charge for delivering newspapers, believed to be the first time this was done in the country. In 1927 he started a business in Scunthorpe selling furniture. He expanded this in 1935 by purchasing an adjacent Methodist Church and converting this into a showroom with offices above. This was called Heslam House, pictured below. Following the start of business in Scunthorpe in 1927 the Heslams moved to a rented house in nearby Winterton where they lived for the rest of their married lives and where J R was a supporter of the Methodist Church. 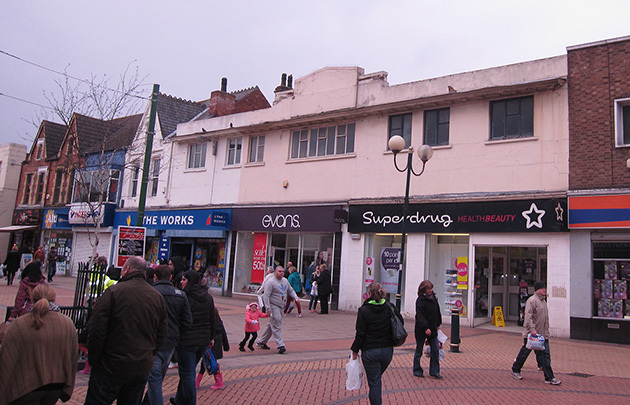 There followed many property deals in Lincoln and around the county including a Market Garden at Brant Road Lincoln and in 1948 the Welcome Café in former bank premises at 191 High Street Lincoln, pictured below. 1949 Joined Lincolnshire Health Executive Council (later Chairman). Was Chairman of the following: Divisional Education Executive, County Education Authority Development Committee, Lincoln Hospital Management Committee, Sheffield Regional Association of Management Committees. The Scunthorpe Internal Drainage Board and latterly Scunthorpe Hospital Management Committee. James Reginald Heslam became one of only three advisors in the whole country to the Ministry of Health Advisory Committee for the recruitment of Nurses and Midwives. Amongst all of this he was at one time a member of Brigg Rural Council. In addition to the Donation made to form the Heslam Trust, James Reginald had already paid for land for a sports field in Scunthorpe (Known as Heslam Park) and given a generous donation towards the development of The Trinity Methodist Church in Winterton in 1962, and for many other causes. While he is remembered as a serious person, much respected for his honesty and straight dealing, he was known to have a good sense of humour. This was put to the test one night when driving through Scunthorpe he collided with an elephant. After recovering he said he would lobby parliament to ensure that Elephants should be fitted with rear lights. The condition of the elephant was not reported. Born 1st March 1867 in Carlton Ie Moorland, he joined the Royal Artillery as a boy soldier in 1882. Married to Sarah Jane Chappell of Thurlby on 7th January 1892. Died of pneumonia 26th July 1900 at the age of 33 years, while taking leave from duty in Bermuda. Born 10th September 1866 as Sarah Jane Chappell of Thurlby. Born 3rd July 1893 and baptised on 22nd August 1893 in Woolwich. Married Mary Elizabeth Barnes on 12th June 1918 at Harmston. Died in a convalescent home in 1965. Born 12th February 1895 at Farnham Hants and baptised 7th April 1895. Married C W H Rushby on 4th June 1919 at Harmston. Died June 1984 at East Retford. Born 9th June 1897 and baptised 4th July 1897 in Bermuda. Died 24th March 1902 at the age of 5 years. Born 10th August 1899 and baptised 3rd September 1899 in Bermuda. Married Gladys A Tinkler on 26th December 1924 at Skegness. Died 21st June 1973 at Nettleham.